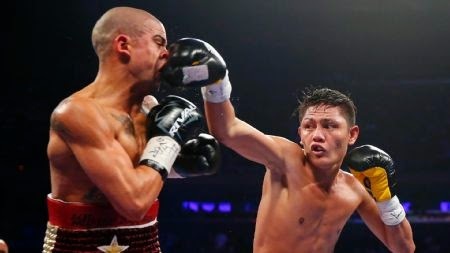 Marvin Sonsona win via Split Decision against the Puerto Rican Boxer Wilfredo Vazquez Jr. A top fight for both fighters but ain't impressive match for the fans. The fans was disappointed and they didn't like the decision from the Judges. As Sonsona looking for a retaliation back from his TKO lost last 2010, Sonsona now got his revenged and also got his pride as one of top fighter in featherweight division. In 2010 Marvin lost to Vaquez via TKO in round no.4, an aggressive Vazquez and a lazy Sonsona we saw that time. Sonsona was loss his chance, but this time Sonsona move up and ready to fight much higher level boxer or a possible World title. Sonsona now has a record of 19W(15KO)-1L while Vazquez goes down at 23W(19KO)-4L. In first round Marvin knockdown Vazquez by body shot but Sonsona can't capitalize and not able to end the fight. In round no.5 Sonsona penalized and reduced 1 point by the referee for hitting Vazquez at back. After the hard hitting blows from both boxers, the fight was ended via Split Decision win from Marvin Sonsona. Two judges scores 96-92 for Sonsona and one judge scores the same for Vazquez. Sonsona having his great comeback and now he is waiting for a world title.